Made with your safety and convenience as top notch, our two portable electric doorbells with receiver will come to add peace of mind in your daily life, ensuring the arrival of your guests is clearly announced wherever you are! Install each remote button in your front, side or back doors. With up to 10 additional push- buttons, both the receiver and the transmitters can be configured with different tones, to let you conveniently distinguish which door the visitors will enter from. 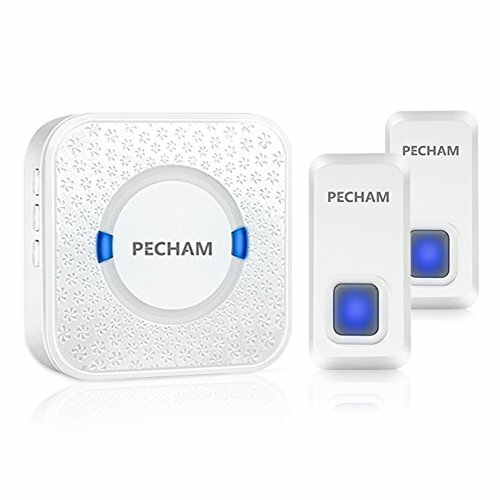 At PECHAM we take pride in the quality and craftsmanship of our wireless plug-in doorbell and back it with 18-month warranty. If you are not absolutely thrilled with our two-receiver electric doorbell, we will be glad to exchange it for you or offer you a full refund.